This entry was posted on Monday, October 10th, 2011 at 07:21 and is filed under Barack Obama, Culture, Occupy Wall Street, Politics, War. If you have checked out Glenn Beck's program, You would have known this a long time ago. Actually, I have watched Beck's program, and I've know the underlying facts of this longer than I've been aware of Beck. Not all of my readers are aware. I'm trying to change that. Thanks! You make the mistake of believing the Republican Party is the United States. Big, big mistake. It misleads you into making mistakes of thinking all around. The Republican Party primarily represents the interests of those who are profiting from the destruction of American society and democracy. It works to divide Americans from each other along the artificial line of ideology. It is owned, this party, by the super rich who use propaganda rooted in fear and resentment to trick people of modest means to vote against their self-interest. The Democratic Party is no better. It's also owned by the super rich. It tricks people of modest means into believing it stands for their interests, but it stands for the interests of those who own it. The American system has been destroyed and only the people, left and right, north and south, rich and poor, can put it back in working order. This will require that we stop demonizing each other and dividing ourselves from each. That we start talking to each other and working with each other to save what we can of democracy before the plutocrats rip it entirely out of our grasp. Hogwash! To pretend that there is no essential difference between the rank and file of these two parties is a joke. The leadership in both parties has been similar, but even there, the two parties are not indistinct. The message of Occupy Wall Street is simply: "we're here to get what we want, by force, if necessary." Mark America to respond to someone’s opinion with” hogwash" is disrespectful. This country was founded on differences. I agree with chrisofpierson, all political parties are the same in that their agenda's are for the "rich and famous". Let's face it the world is run on a "class" system the have's and the have not's. You know that's ok to some extent but when it gets to a point that as an American citizen (and a "have not in most people's eyes LOL) I see our children homeless and hungry, and our government sending BILLIONS and BILLIONS of our taxpayer money to foreign countries I have a serious problem with that! It has been written that to destroy America turn them against themselves. Ya know folks its working! Us “have nots” far outnumber the “have’s” yet we have turned against each other which gives us no power and strength to turn this country around. We are losing our freedoms more and more each day, I shudder to think of what my grandchildren will live with. Yes Char, it is disrespectful, because I have no respect for that particular opinion. Of course, since you agree with him, you'd have to complain about the "hogwash" remark, wouldn't you? So, ditto to you on that score. You're not listening, clearly. You don't have a clue what #ows's message is. It's dishonest to not know something and claim to be able to say what it's "message" is. I'll tell you again what the actual message is: the moneyed class owns the government. It has for years. What the people want and what the government does are two different things. I believe left and right can agree on that. The govt. does what it's owners make it do. The first American revolution was also about citizens taking action to wrest power from the 1% and take it for themselves. Some of those who made the new government were radicals like Jefferson. Some were more conservative like Adams. They were mortal enemies inside the political system they helped devise. Once outside, they became the closest of confidantes. The same is possible between left and right if we learn to talk to, rather than around each other. Oh, I'm listening pal. What I'm hearing is: "We want a free ride and we want it now." Yes, at any moment George Washington is going to leap out of this crowd. Yes, you're a regular Thomas Jefferson. John Adams…right. Do you know what those guys would do with your OWS leaders? They'd get together and hang them for treason. Yes, these leaders of the OWS would be hanged for treason. Anyone with internet now.. (smile) can research who has organized this, who is maintaining this, who is funding this. Try Unions, try the Socialist Party, try Moveon.org, try Soros. Not all of our repubs are for this. I smile when obummer, reid and the dems call the repubs holding them hostage. Those of us who are middle America, still not brainwashed with the entitlement mentality have made a difference in 2010 with the change in elected officials. I laugh.. They are doing exactly as they are supposed to do. 2012 is the most important election in our lives. We will vote for liberty and the constitution or tyranny and opression. Most don't even know. OWS, wow. They are being coompared to the Tea Party. There is a night and day difference. Control and controlled….and they don't even know. By the people for the people. Government works for us and it is up to us to ensure that! A few in Washington know and even more will be surprised who their daddy is in 2012. I really appreciate your site. Your candid words and observations put into context that most anyone can understand without all the rhetoric. Thank you. You would enjoy listening to Sarah Palin's October 7th speech from "Defending the Republic". The OWS folks are meant to be an arm of the Plutocrats you speak of even if it is unwittingly. Stand for something or fall for everything. Just to clear something up..Do you realize that a democracy is inherently evil? If nine people vote to kill the tenth person and divide his possessions up amongst themselves, by the rule of democracy (majority rule), they win. It doesn't matter if it's legal or not, morally sound or not, majority wins. That is why our constitution guarantees us a REPRESENTATIVE REPUBLIC form of government- NOT a democracy. So you would also argue that guns are inherently evil because they might possibly kill an innocent person? Or that carrots are inherently evil because they might also choke an innocent child? I don't think the founders made the distinction the plutocrats behind today's Republican Party would have us think they did. Democracy is bad news for plutocrats. That's absurd. The founders new quite well the difference between a democracy and a republic. You might revisit the arguments between the federalists and anti-federalists for evidence. Of course, you're in a hurry to blame it on vague notions of "plutocrats." The truth is that you're barking up the wrong tree, as usual, and no, once in a day is enough link-back to your site. Mom would have not referred to these folks so nicely, I'd bet she would call them "occupigs." So, we traveled all over the world to "defend the free world from communist aggression and their persistence still allowed them to slip under the door like a bunch of roaches. Ah, but with people like Mark America, his wife, Mrs. Palin and Representative Issa I don't think they are gonna win this time either. I too believe that there are many in both parties who are corrupt however there is a huge difference when it comes to the ideology between the parties. Now that the Tea Party has been gaining strength, I have seen a big difference in how the GOP acts with the Tea Party breathing down their necks. Their main goal as I see it is to bring this country back to where the framers of the Constitution intended it to be which is The United States Of America, not the United Socialist States of Communist America which I have been watching this country go down this path of destruction since the Johnson administration. Not from the Republican side excluding the RINOS, but from the infiltration of communist marxists of the Democrat party, which by the way Senator Joe McCarthy saw coming way before I did and we all thought he was crazy. Well now we are watching people demanding that the people who worked hard all their lives for, share in their success and good fortune. This is called coveting thy neighbors goods. This capitalistic society liberals hate so much happens to be the most successful system in world history and America will only fail if the liberals have their way. Learn your history people or you are doomed to repeat it. Work hard and be content with what you are blessed with. Great post Mark! Hitting the nail on the head as usual! Christofpierson, The GOP may well have its share of fat cats and crony capitalist, but they do not represent the party or the people. We do. And, in case you hadn't noticed, we are quietly, and non-violently booting them out and taking it back. The Dems, despite their squealing accusations and finger-pointing, have the controlling interest in crony capitalism and corruption. Wall St funds, supports, and fills the cabinet of the Obama administration. Furthermore, they have no desire to even try to clean up their act. The smelly and unruly bands of vagrant protesters roving the streets of our cities are little more than herds of thrill-seekers, clueless "Borg-like" followers of the current social fad, and a few well-meaning individuals who have no idea why they are really there. They have to join the protest before they find out what's in it. Add the busloads of hired union thugs, entitled deadbeat groups, and flatout goons, and you have your "movement". If you take the time to find out who is organizing, leading and funding these gatherings of "What's It All About, Alfies", then you know their message and their goal. Push to overload the system, crash the sytem, destroy capitalism and replace it with their own brand of socialism. Go back and read Mark's article. He correctly named these greedy and unprincipled groups and individuals. The system has not been destroyed, Chris. And the US is not a Democracy. It is a Republic. Democracy is "..2 wolves and a lamb arguing over what to have for dinner." Our republic allows us to be a well-armed lamb. We are armed with the weapons of education, information, self-reliance, and the constitutional processes provided by our Founding Fathers. We are armed also with the determination that freedom will never be taken from us or our children. That's the message of the #ProductiveWorking CitizensOfAmerica. And isn't out funny trust it was the democrats that bailed out the very people these liberals are protesting….it's just too much! You missed the point, big time. The point is to fix the system which is corrupt and has been for decades. The thing is, people are finally waking up to it. The government lies way too much. It has way too much power. It is under the control of corporate elites. Either wake up or stay a sleep, but don't spread lies when you don't even understand the facts. I understand the facts. Do you? Who is Van Jones? Who does he associate with? Who are his people? Communists, socialists, marxists, and the Obama administration. Period. They are all statists. All of them. These are the people who have brought you the century-long decline in America. Don't come here telling this audience to wake up. You're awfully new to the party, pal. Better think again. I didn't miss anything. The problem with most of these so-called 'enlightened' socialists is that they truly believe they know the answers when in fact, they've been lied to BIG TIME. Some of them may have good intentions, but they've got brain-damage from all that pot and just don't get how wrong they are. Communism has NEVER EVER WORKED ANYWHERE. Ask the Russians. Ask the Cubans. Ask anyone. Except Van Jones, Fox Piven, Obama, Soros and anyone else who is a commie. Mike, where do you think the big government comes from? And who do you think is controlled by the corporate elites? Liberal or conservative, who gives a ****? They are no different. 8 years of bull**** from Bush. 4 more years of bull**** from Obama. He said he would get the troops out immediately, then he changed it to 16 months, and now he wants to send 40,000 more? These people are bought, the differences in ideology is only the face they show to brainwashed ******* like you who take it seriously. Wake up. Mike, You want to post here? Curb the language, and save that gutter trash for the guys now defecating on cop cars on Wall Street. Not here. I'm happy to have you come along and disagree. In civil language. Now, as to your points: Bush was no conservative. We haven't had a full-on conservative since 1921-29, and the closest we have gotten in the interim was Reagan. There have been a number of republican presidents, including Eisenhower, Nixon, Ford, Reagan, Bush, and Bush. Only one of those was significantly a conservative, and that was Reagan. You misunderstand, so let me help you out. The problem is statism. Now, ask me since 1913 how many statist presidents we've had, and I'll be glad to tell you that other than Harding, Coolidge, and Reagan, they've all been statists. You want to know who has stolen your country? The statists. 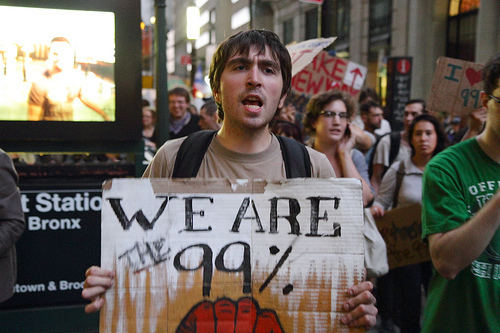 Who's directing the Occupy Wall Street protests? The statists. Now, you can curse up a storm until your eyes explode out of your head, but that's the deal. You know who's behind the Tea Party? Individual citizens. Notice the difference? You should. Now, don't come here and tell me to wake up until you've learned the difference, and until you've come to grips with the fact that you've been listening to a lullaby older than time. haha, you made me laugh outloud again. Yes, it has been a long time since a real conservative has been in the white house. The a good portion of our problem is our educational system, and, for a very long time, perhaps 50 years. Contrary to the above post, being educated, schools and colleges are teaching ideals and social acceptance with the intent to teach good learning. They are not teaching good thinking.. (smile) It looks to me history is repeating itself again. I believe so very few would be occupying WS if they questioned their professors more, read more of history. I am glad, very glad that there has been some of us who have had our "Matrix" event and opened our eyes. I wouldn't want to wake up a year or so from now and say "WTF" without an idea what happened or had a fight. I have had to learn things all over again. (smile) Many of my friends think I am a fringe fanatic. I would laugh again but it is such a serious time. I spend time trying to let most everyone I know and meet what is going on. If I open someone's eyes, it is another awakened mind. You know what? I am glad I am as old as I am. I have less time ahead of me than behind me. In these times, at this time it is better. Isn't that depressing.. (smile) I would not want to be these 16 to 30 year olds looking at what they see as their future either, even as mislead they have been. OUR fight is theirs, their fight is ours. If they would only see that we do see what they see.. whew! I still will do all I can to make their future better. I want my children, my grandchildren to know I stood for their liberty, their rights and freedoms no matter what. 1. I haven't heard anything but mindless platitudes from the OWS crowd. They're either too stupid or too cowardly to admit their socialism so I have ZERO respect for them. 2. Thank you for pointing out that we haven't had many conservatives presidents and that the Republican party isn't really very conservative. 3. From looking at the campaign contributions online, it looks like the Dems are the ones beholden to "the rich". 4. My take is that the dominant culture is "progressive" and the "elites" are mostly "progressives" (even Bush). They really can't help but to tax and spend more because they don't have any other answers. They are corrupt for sure, like most elites of all time (and most people in general). Change the elites and you'll simply get another set of self-serving idiots to complain about. We'd all want to change the world…. Don't you know know it's gonna be alright "